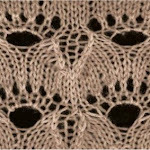 I’m getting ready to go to Stitches in Schaumberg this month. I went for the first time last year (much overdue). I intended to write about it last year, but I had one of those experiences that evoked feelings that can only be described by that old saying, “A goose just walked over my grave.” I ran into someone that I had not seen since my first year at college. A chance meeting that gave me the chills. I showed up for a Stitches class in the morning, early like I always am. My father believed that if you weren’t 15 minutes early you were late. He enforced that fiercely; being early is like a disease with me. A woman came in a few minutes later. She kept making nervous chit chat. The phrases she used were annoyingly familiar; excessively polite; and scripted, as if she was reading from a Miss Manners textbook. It took a few minutes and then things rushed together. I couldn’t see her name tag clearly, so I tried to judge the shape of the name, the contour of the letters. The shape fit the name I had in mind. And then the memory of the face came back. She had not changed much. Older, heavier, but very like she had been. And when I was almost sure I asked, “Were you in Carbondale in 1973?” The look on her face answered the question even before her words came, “Yes, how did you know?” “I was there.” “Forgive me, I don’t recognize you. Who are you?” “Elaine.” And then she remembered me. And I knew for sure it was Valerie Jane [last name withheld]. She came over to sit next to me. She asked all the polite questions and we exchanged the abbreviated versions of our life stories. I had completed college; she had not. I married and had kids; she had not. It was not just her appearance that had not change much. Her whole life had change only superficially. The only shocker was her current profession. She was an insurance salesman. Shocker? Just wait. She sold insurance to a niche market: adult entertainment. I had to hold back a laugh although it must have showed on my face because she launched into a justification that boiled down to “They need insurance too.” Yeah sure, Tony Soprano needs insurance, too. What a hoot. That explains a lot about insurance rates. I could almost write a book about Valerie Jane. She could have been a psychology case study. Usually, she was Valerie, the overly officious, tedious, mistress of idle, polite chit-chat with her mother pushing all her remote control buttons. But sometimes she was Jane. Jane was more normal, a regular 18 year old looking to enjoy life and get laid. She would even refer to herself by the two names in the third person. I more than once witnessed an argument between the two. That was creepy. I don’t know if she had a true multiple personality, but she sure had something going on. Perhaps Valerie stays home to knit and Jane goes out to strip joints to sell insurance. That presents an image. There were 5 or 6 girls thrown together by chance in a college dorm in the summer of 1973. I have so many memories of the troubles caused by Valerie and Jane trying to manipulate the events of that summer. Until finally the rest of us figured out what was going on (sort of). The story is far too long and complex to tell here. Just to be catish: She borrowed a copy of the winter craft issue of a magazine that had a favorite afghan stitch cape pattern in it and she never gave it back. I’m still miffed about that. Maybe I’m the crazy one! Thirty-five years later and I’m still not letting go of that grievance. I tried to explain to my husband how badly running into Valerie Jane had shaken me. I even left Stitches early, missing one of the classes I had paid for. I know it sounds paranoid, but she scares me a little. I wanted to put the distance back between us. I still can’t put it all in words. However, I am going back to Stitches. She may be there again because it is not so far from where she lives. It’s just a risk. Fortunately, the place is big enough to hide in. But if I do run into her, I won’t miss the chance to ask where that cape pattern is.